4,4,5,5 - 4,5,5..........Bingo von Ellendonk. 4,4,5 - 4,5................Cona von Niederkassel. 5,5 - 5......................Satan von Ellendonk. 5,5 - 5......................Blanka von der Au. 1999: 99-95-92 = 286 points (1st). 1999: 99-93-94 = 286 points (3rd). 1998: 96-92-94 = 282 points (7th). 1999: 92-96-91 = 279 points (18th). 29/11/1997: 100-94-96 = 298 points. 29/11/1997: 100-94-96 = 290 points. Alfred von der Urftquelle was the winner of the working IDC World Championship in 1999 with 286 points and placed third at the D.V. Meisterschaft in 1999 with 286 points and placed eighteenth at the 'all-breed' V.D.H. Deutsche Meisterschaft in 1999 with 279 points. He also passed the Körung 'for life' with highest rating for working drives and middle sharpness. His sire, Mannix von der Weyermühle, was a working police dog in the Düsseldorf area of Germany and passed the ZTP with 1A rating for character and SG for conformation. Alfred's maternal grand-sire, Hertog Conan van Manensheide, passed the Körung 'for life' with highest rating for working drives and was the winner of the working IDC World Championship in 1993 with 285 points. Alfred lived to 5 years of age (passed away from severe pneumonia), his sire to 5 years of age (Mannix died from injuries sustained protecting his police handler in a riot) and dam to 7 years of age. Addy: IPO 3 and passed the Körung with Körklasse 2A rating. 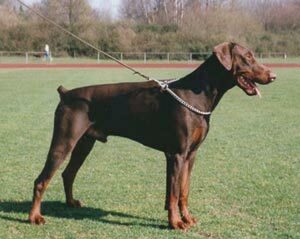 He is sire of the vom Burghof “A, B” litters (Akascha, Aycka, Bosz, Brabus) and vom Elbenwald “A” litter (Ashley). Asco: IPO 3, FH, competed three times in the D.V. Meisterschaft and passed the Körung 'for life' with highest rating for hardness and working drives with middle sharpness. He is sire of the vom Ferrenberg “I” litter (Ilk); vom Eschenbruch “K, L, O, P” litters (Kuba, Lucky) Briska's “A, Z” litters (Zarek) and vom Burgwald “R” litter (Rocco, Ringo, Ria).